January 8th marks the one-year anniversary of the launch of Kokoro Yoga ™. Kokoro, from Japanese culture, means “heart” and would translate better as “spirit” or “wholeness.” The term caught my attention when I considered what happened to the warrior-athletes who boldly step into the crucible experience of our SEALFIT 50-hour camp. There was more than mental and physical toughness happening in those events. There was an ineffable feeling of tapping into heart, of connecting to deep spiritual strength and of opening up more “mind” than ever before. So Kokoro seemed an appropriate idea and name for that event, and it stuck. A massive challenge such as a crucible event like Kokoro Camp, or a crisis, will create a temporary experience of kokoro. But there is a more refined way to connect to the permanent experience of heart and wholeness. That is through a daily, disciplined practice of integration. And thus, Kokoro Yoga evolved to be a daily practice of heart for our clients, born out of my personal training. Kokoro Yoga is based on traditional yoga, in particular with a connection to its warrior roots which have been lost to the modern world. I have been training in the martial arts and modern yoga for many years and note the strong connection between the two. Kokoro Yoga was spontaneously created when I was in Iraq in 2004, as an integration of functional fitness, traditional yoga and martial arts techniques. 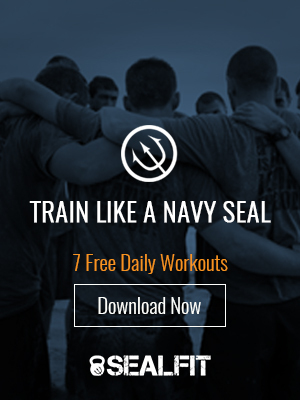 I wanted to continue my inner training while with the SEALs there but also needed to keep fit and centered while in the most negative and challenging environment I had ever experienced…combat. The effects were dramatic so a few years later I began delivering it to SEAL candidates and other SEALFIT athletes. We considered it the “working in” to balance all the working out we did….and it worked. Kokoro Yoga is a personal practice for your inner self – which leaves behind any quasi-spiritual words and connection to a religion you may not be interested in. It doesn’t require spandex pants or even a mat. It is designed to meet you where you are at, and not embarrass you because you can’t put your leg behind your head, nor make you wonder where the beef is if you are a SEAL. Every training session is meant to be custom fit to your needs – whether they be physical, mental, emotional or spiritual. Last year Catherine Divine (my stepdaughter and head instructor) and I put together a free 30-Day Kokoro Yoga Challenge to expose our tribe to this unique and extremely rewarding training method. We intended it to be a one-time thing, but the response was so strong we decided to offer it annually. Here are some ways that Kokoro Yoga is unique when compared with typical studio yoga in the West. Both a Practice and a Lifestyle: Kokoro Yoga can be both a practice, providing powerful tools to aid in your physical and mental training, as well as a set of principles for living an enriched, unbeatable life. Flexible and Variable: Variety is the spice of life and Kokoro Yoga is flexible, providing for maximum variability to meet your specific needs. Doing the same rigidly fixed form year in and year out will lead to a rut, burnout and injury. Variety is a good thing that can be found by changing up pose sequences for a particular effect, changing the duration based on your time and intention, and also flexing your practice into the times of the day that you train. Intentional: Rather than just hitting a yoga class for a workout, we are clear about the intention for our training, and the result for each session. Kokoro Yoga can be performed to enhance athleticism, to develop strong leadership traits, and for spiritual enlightenment. In the case of a warrior, these goals are relevant and will be developed with the methods employed throughout the challenge. Balanced: Train hard, train soft. Train long, train short. We use yoga to find balance in our bodies, minds and lives. We seek a balance between effort and surrender, between work and recovery. Adaptable: We adapt the movements to our bodies rather than try to adapt our body to the pose. With Kokoro Yoga, you approach a pose with your own level of flexibility, mobility, functional fitness and prior injuries that you need to adapt for. Integrated: Accelerated growth occurs when we embody training in an integrated manner. You will be developing yourself along the five mountains of Unbeatable Mind: physically, mentally, morally, emotionally, intuitionally and spiritually. These intelligences become deeply connected when you actively integrate the training of them, unlocking your full potential as a human. So you can see that Kokoro Yoga can do far more for you than just work up a sweat. It is about deepening your warrior spirit, merging your heart and mind into your actions. Ultimately it will help you achieve your maximum potential. It is a practice to fulfill my favorite mantra “day by day, in every way, I get better and better.” I encourage you to join us for the upcoming 30-day challenge and experience the magic yourself! P.S. Start the new year right by developing a new daily ritual, gain mental clarity and focus and make positive, healthy changes to your body by joining me, Catherine and countless others for our free The 30-Day Kokoro Yoga Challenge. Starting on January 9th, 2017, all you need is 15 minutes a day for 30 days to make impactful changes to your mind, body and spirit. To learn more about the challenge and sign up, CLICK HERE.